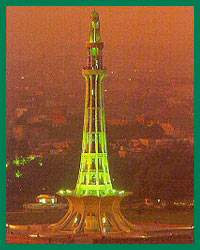 Minar-e-Pakisan is a new landmark in Lahore and stands in the Iqbal Park to commemorate the date when a resolution was passed there back in 1940 demanding the creation of separate homeland for the Muslims of this sub-continent. The Minar is a blend of Mughal and modern architecture and has been very boldly designed. The Minar is about 60 metres tall.